Tired of the same old puzzles? This free Daily Jigsaw puzzle game is the cure. Bookmark this page, because now you have a different jigsaw puzzle to solve every day of the year. Jigsaw puzzles are great for brain training. They strengthen short-term memory, spatial skills, and concentration. Find two connecting jigsaw pieces and drag one to the other with your mouse. When you release the mouse button, they will snap together if they fit. If you've activated the piece rotation feature, you can press the Spacebar to rotate a piece. There's a lot of pink in this jigsaw puzzle game, but guys don't let that put you off. In addition to the daily puzzles on different themes, this game has lots of features and customization options. Besides, you can change the background color through the Options screen. For example, there's a leaderboard that displays the names of those who solved that day's puzzle the fastest. Compete against other jigsaw puzzle players worldwide! You can also modify the difficulty of each puzzle. Solve the puzzle in 24 pieces, 54 pieces, or 117 pieces - your choice. You can solve the puzzle using square pieces or normal jigsaw-shaped pieces. You can even set an option that allows you to rotate pieces. This free daily jigsaw puzzle game has even more cool options, such as a puzzle picture preview, move multiple pieces at once, show the completed picture, and view only the edge pieces. The theme for the daily puzzles changes every week. 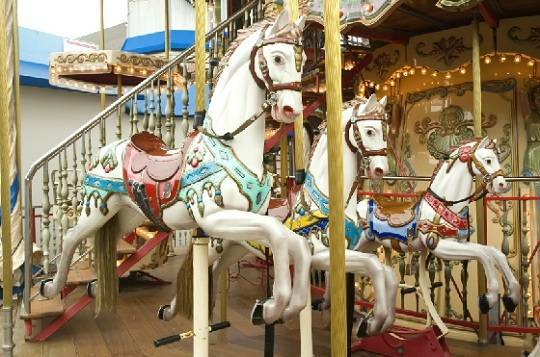 For example, the puzzles for a particular week might all have a "circus" them. The next week, the jigsaw pictures might all have a "beach" theme. And so on. If you like this game, you might also enjoy the Tropical Fish jigsaw puzzle game. HOW TO PLAY. After the game loads, the main menu screen appears. This screen shows which puzzles are available for the current week. Click the puzzle you want to play. You aren't limited to only playing "today's" jigsaw puzzle of the day. You can solve any of the puzzles from Monday up to the current day. You can even re-solve a puzzle you've already completed. For instance, if you solved the 24-piece version of a jigsaw puzzle, why not try to solve the 117-piece version as a bigger challenge? 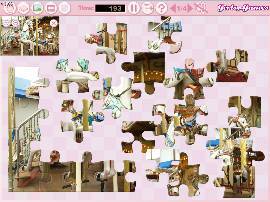 Once you click on the puzzle you want, the free daily jigsaw puzzle Options page appears. On this page, you can choose the number of pieces in the puzzle, the shape of the pieces (square or jigsaw shaped), and whether or not pieces can be rotated (using the Spacebar). After setting your options, click the Start button. This opens the puzzle board where you can begin solving the jigsaw. Options available while solving the puzzle are displayed on the Options bar along the top of the puzzle board (shown below). Move a Piece / Move Multiple Pieces. This option defaults to moving one piece at a time. To move a piece, hold down your mouse cursor over the piece and drag your mouse. Click this button once if you want to move groups of jigsaw pieces at a time. Picture Preview. Click this option to display a thumbnail of the completed puzzle in the upper left corner. This is very helpful when solving jigsaw puzzles that have a lot of detail. Completed Picture. This option briefly displays a large image of the completed puzzle. Edge Pieces Only. I usually start with the edge pieces when solving a jigsaw puzzle. It's a logical way to frame the picture and usually can be done fairly quickly. Click this option to hide all non-edge pieces. Change the Background. Click this option to select from eight different puzzle background colors, including blue, green, gray, white, and others. Time. You need to solve the free daily jigsaw puzzle quickly if you want your name on the leaderboard. The Time box displays the amount of time you've taken on the puzzle so far. Game Paused. Need to take a break but don't want to mess up your chance to get on the leaderboard? Then click this option to pause the timer until you return. Back. Click this option to return to the Main Menu screen. Help. This button shows explanations of the options. 1 / 4. I don't know what this option does. I couldn't get it to work. Speakers On/Off. 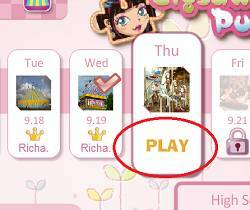 This free daily jigsaw puzzle game has a cutesy soundtrack that plays by default. You can turn off the sound by clicking this option. Here's an example of a jigsaw puzzle that I completed today. As you can see, these pictures are quite detailed. Selecting the 117-piece option gives you a puzzle that will certainly keep your brain occupied for awhile. I've loved solving jigsaw puzzles since I was a kid. Set up a card table, dump out a 500 or 1,000 piece jigsaw puzzle, and work on it for days. This free daily jigsaw puzzle game lets you solve a different jigsaw every day without the mess! Game distributed by Spilgames.com. Used with Permission.